In our modern, fast-paced world, it’s easy for home design to become another source of stress. Not only does each room have its own demands, but it’s also important for each part to integrate with the whole. If you’re worried about whether your home is up to standard, here are 10 home design trends that are blowing up this year. Stick with these and you’ll have no trouble turning heads. Paint—it’s the most subtle and psychological aspect to home design, but also one of the most essential. But between swatches, hues, tones and perplexing naming patterns, it’s easy to get lost. If you want to keep your interior paint up to date, darker, warmer colors are a safe bet. Behr’s “In the Moment T 18-15” helps create a peaceful, relaxing feel, while the vivid “Honeycomb HGSW2133” by Sherwin-Williams provides a more energetic hue. Flooring trends emphasize natural elements such as stone and wood, putting much less focus on traditional staples like carpeting. Waterproof options are huge, as are hand scraped textures, plank patterns and bright flooring colors such as greys and whites. You’ll likely be spending a lot of time in your living room, so look for that perfect balance between attractive design and comfort. Keep an eye out for rugged, sophisticated materials such as wood, concrete and velvet. For something brighter, patterns such as florals and bold hues like green and yellow are safe bets. Modern living can throw a lot of daily stressors our way, so consumers are putting a renewed focus on nature and mental health when considering their backyard designs. An abundance of lush, green plants helps create an environment of tranquility, as do water features and fire pits. The goal is to carve out a low-maintenance space for meditation and relaxation. Bedrooms are for relaxing, so current trends emphasize colors and furniture that contribute to peaceful vibes. Ditch the traditional nightstand for hanging light fixtures. Get creative with surrealist themes, mix patterns, incorporate geometric shapes and include modern touches such as docking stations for electronic devices. Stylish and contemporary are the buzzwords when it comes to bathroom design. Matte black fixtures provide a sharp contrast against white countertops while mixed, quiet wall tiles contribute to the serenity of the space. Freestanding furniture such as antique cabinets and large tropical plants are also hot trends. For movie-buffs or sports fans, a state-of-the-art home theater system is a must. 4k Ultra HD is blowing up, as are giant displays such as LG’s smart projector and Samsung’s massive “The Wall,” a TV that measures 146 inches. Soundbars are an essential way to get theater quality sound without having to cart around bulky speaker units. Kitchens are natural spaces for creativity to flourish, whether in cooking or design. Herringbone floors are huge, as are dark countertops such as soapstone, which combines bold design with low maintenance and durability. Also consider vintage rugs and two-tone cabinetry. Plus, updating kitchen flooring can also increase the overall value of your home. 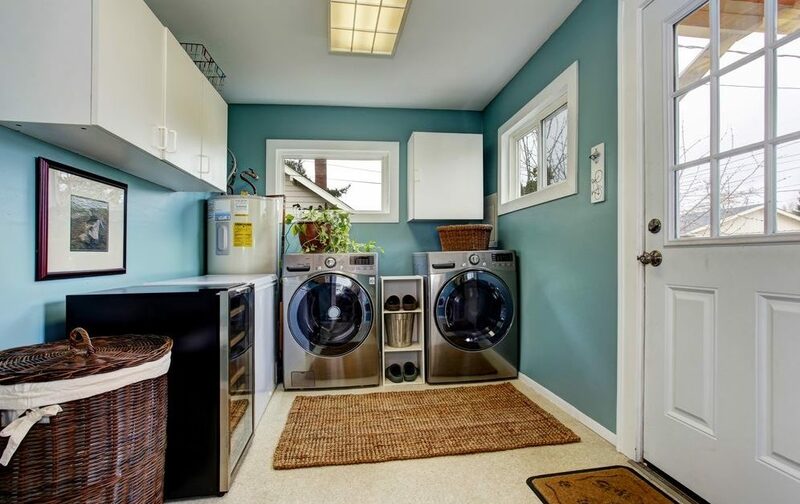 Whether you want to or not, chances are you’ll be spending a significant amount of time in your laundry room. Perhaps the most important trend is increased storage. Built-in cabinets and coat racks are essential for just about anyone. Laundry rooms also often double as pet palaces, so leave plenty of space for Rover. Stylish design elements such as slate floors and granite countertops can easily transfer over as well. The trend that ties together every element of a modern “smart” home, automated technology is invaluable. Wearable technology is in. So are voice assistants—everything from appliances to lighting will soon be integrated with devices such as Google Home or Amazon’s Echo. And smart home security adds a myriad of ways for you to keep your home safe. The question is not whether you should integrate smart technology into your home, but how to best implement it. We know some of these home design trends won’t appeal to everyone’s style or needs. Whether you’re looking for houses for sale near you or just interested in updating your current home’s design, these tips will hopefully inspire the interior designer within you.